Oh Boy, what a busy couple of day's we have had. I'm going to have to keep it short and sweet tonight so I can have a rest and recover. Our Mr 3 became Mr 4 today and we celebrated with a Pirate Party. Everyone who came had made an effort to get into the spirit of things, mainly with home made hats and bandanas and the like, and it was really fun to see. 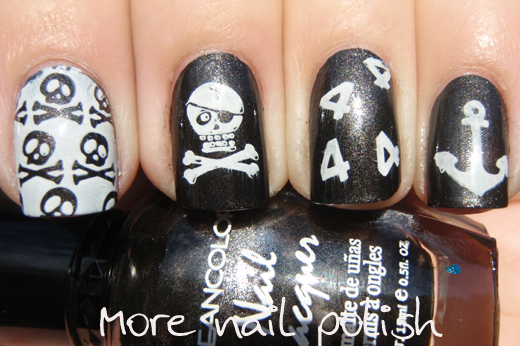 Naturally, I had to put on some specific birthday themed nails for the occasion, and one doesn't get a much better excuse to wear skulls and cross bones in their mani than when they are dressed as a pirate! I used Kleancolor Metallic Black for the base, which is an awesome one coater with a silvery shimmer, but it does take a bit to dry! 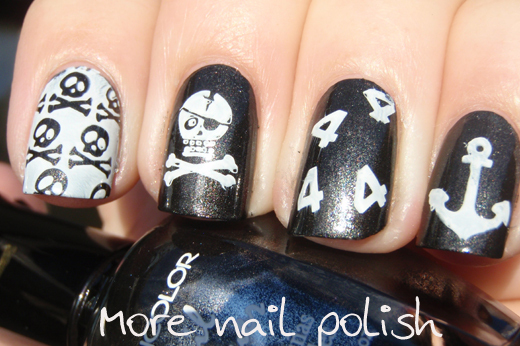 I then stamped using Konad special white polish, the number four for the birthday boy, and various other pirate themed designs. 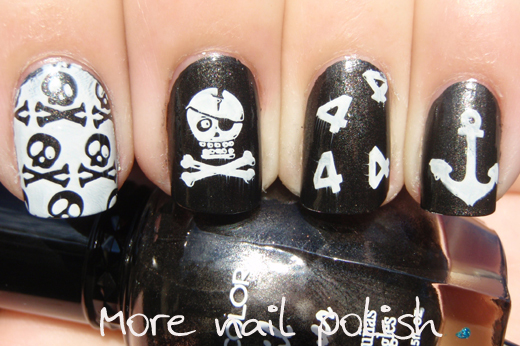 My thumbs also had large skulls and cross bones. I was very happy with my efforts for his birthday cake. 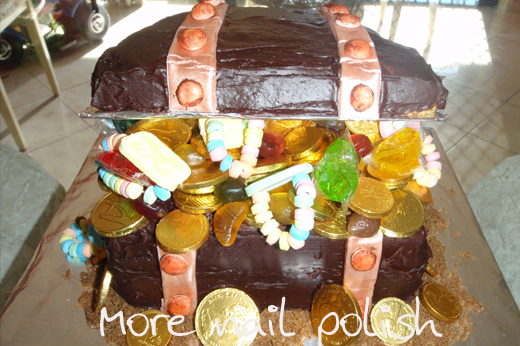 I make a treasure chest which was filled with chocolate gold coins, candy bracelets and other jewel looking lollies. It tasted really good too. And here are my two littlies. Mr 4 in his home made hat and favourite pirate tee (not showing his aluminum foil hook his dad made him, his cutlass or his telescope!). Miss One dressed as the crocodile that ate Captain Hooks hand - and a very cute crocodile she was too! So cute! Love the cake, great job! Amazing! My son would live this! Very cool! Love the cake too! It looks great! Both mani and cake are awesome. He's a lucky kid! 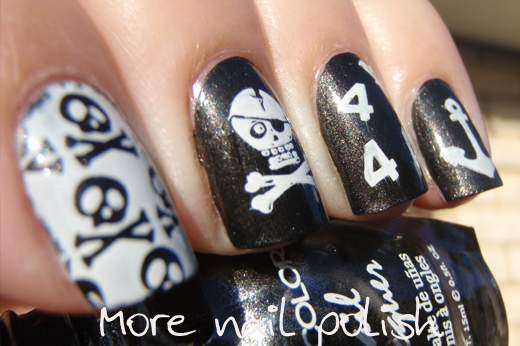 Your son is really cool for liking pirates and skulls. Skulls are awesome! Wow That is cake AMAZING! I want it for my bday hahaha!! Very cute! I'm 29, and I would LOVE a pirate themed birthday. The cake looks pretty great too. how cute! you did a great job on that cake! So cute! 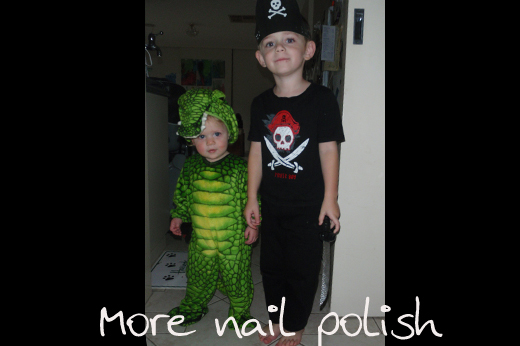 (The nails and the littles). Happy birthday, Mr. 4! So cute and that cake looks delish! Very cute mani & the cake is so well done! Awesome! I love the anchor! Awesome nails and that cake is... wow! Happy birthday Mr 4! That mani is so adorable, and the cake, oh wowwww! Mr 4 is a very lucky boy indeed! That cake looks amazing and they look so cute in their outfits! Well done Cathy! You're nails look great too. Did you dress up? The cake is amazing! And your little ones are so cute! As the mani! Awww, your kids are so cute!! And your nails and that cake are amazing!